On a recent trip to Chicago, I had a scandalous affair with an Italian beef -- dipped, with cheese and peppers -- one late night in Little Italy. It was messy, but I didn't care. I knew the affair might leave me burned (well, heartburn-ed), but it was worth every glorious second. When I got home, I found myself craving another taste of the Italian beef I'd fallen for at Al's No. 1 on Taylor Street. Unfortunately, an authentic Italian beef sandwich is hard to come by in Houston. At least part of the reason, claims Brenda Rivers -- the Chicago-bred owner of BB's Beef & Hot Dog in Stafford, the subject of this week's cafe review -- is the soggy bread that it's served on. How can a sandwich be good if the bread is soaking wet and falling apart? The effect can be off-putting for some. "You have to try it first," she says. "That's the reason I let [customers] taste everything first before they buy anything." I only needed one taste before I knew that I'd found the closest thing to Al's in Houston; I became a fan of BB's in that one, small bite. 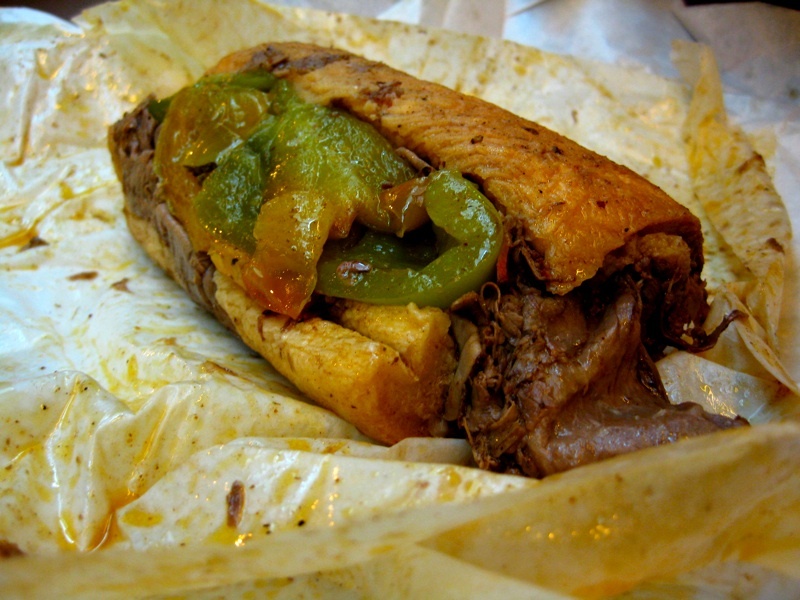 That soggy bread is just one component of what makes an Italian beef so good. "You have to marinate the meat and cook it really long, really good," Rivers says. The roast beef is cooked in a mixture of Italian spices -- oregano, basil, garlic -- and sliced into thin ribbons before being put into the chewy, Italian-style bread, which is just as important, Rivers says. "The sandwich would not be good if the bread is not good." And then comes the dip. Once the sandwich has been assembled, it's dipped back into the broth -- the au jus -- that the meat was marinated in. The meaty, seasoned au jus soaks into the bread while the sandwich is topped with giardiniera, a mixture of spicy pickled vegetables. BB's sells its house-made giardiniera for $5.99 a tub, if you're in the mood to experiment with making your own Italian beef at home. The result is a sandwich that's the pure embodiment of a meat-lover's ultimate fantasy: broth-soaked bread, juicy slices of sirloin and a hot crunch to top it all off. Vegetarians, you have no place here. When I asked Charles Rivers, Brenda's husband and co-owner of the restaurant, what his favorite Italian beef was back home in the Windy City, he hesitated for a minute. "Johnnie's Beef," he finally stated. "And Al's. Yeah, Johnnie's and Al's." "And of course," he laughed, "mine here in Houston!"